With those five words and a cryptic Instagram post[*1] , Grindr has hinted at what appears to be a new initiative to curb discrimination amongst daters. Its name, of course, is Kindr. Grindr has long faced criticism from users who found the app to be an unwelcoming, and sometimes dangerous, place. Many have reported experiencing racism, transphobia, and violent hate crimes on or as a result of the platform. Some have sworn it off completely in response. 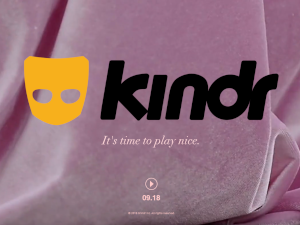 With Kindr, Grindr may finally be ready to tackle the issue head on. The Instagram post features an updated logo and a series of intertwining voiceovers describing their experiences with prejudice on the app. "When someone says something like ‘You know, I don’t date black people’... that would be referred to as sexual racism,” says the most prominent voice. The same speakers can be heard on the Kindr microsite[*2] , also freshly launched by Grindr. Like the Instagram post, it reveals little enlightening information, merely the tagline and launch date (of 09.18) set against a looping video of billowing pink fabric. Responses to Grindr’s promise of a kinder experience have largely been positive. “The anticipation builds. Interested in seeing what will become of this. Given the sizable role the app has within the community, stepping up to address some of the systemic community issues is either a bold and brave choice or a foolish one. Here’s hoping the former,” tweeted J. Clarence (@OhMyClarence[*3] ). The Kindr announcement comes shortly after two high-profile stories of discrimination have been in the news. Transgender model and activist Munroe Bergdorf also called on Grindr to address hate speech on the platform. Munroe took to social media to share screenshots of the abuse endured by some of her black followers who use the dating app. “R u white,” said one conversation. “No cotton pickers,” said another. Bergdorf also revealed that she was meeting with Grindr’s head of communications, Landen Zumwalt, and chief content officer Zach Stafford to discuss changes to the app’s abuse and harassment policies. So far it’s unknown whether the Kindr initiative was planned before or after these public condemnations. For more information on this dating service, check out our Grindr app review.